I am sitting like a good boy. 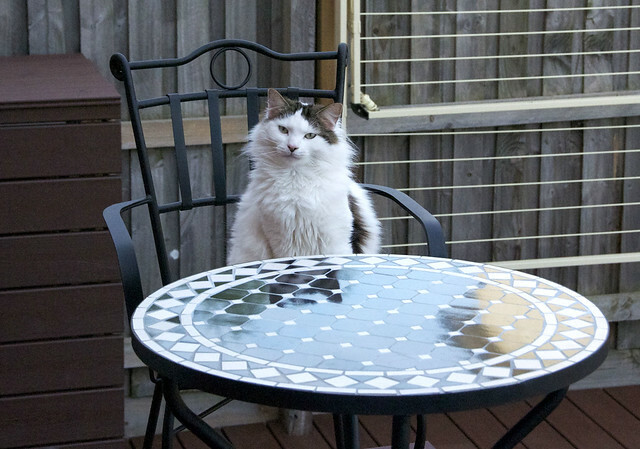 Now please serve me my dinner at the table. Would you like some mouse, Teddy?? Such good manners Teddy. We love Huffle but you are our Star. I like being served at the table too. Binga prefers ON the table, but then she has no manners! Lookin' good, Teddy. Lookin' good. We don't see why not. Sounds reasonable enuff to us. MOL! You look like you are wondering where your order is. you look almost respectable. way to show decorum! Looking like that, you should be served an elegant meal on chrystal dishes! Looks like the purrfect place for a picnic. Shall we have some tea and cakes, Teddy? I'll ring for the butler then. From what we have heard about you, Teddy, this seems a little out of character, but I like it! Yes, I do! You do look like a very well-mannered guest, Teddy! You tell them Teddy. We hope you got some salmons. Oh... I just LOVE this picture!! Please feed this kitty and thanks for the share! Teddy, are you dining al fresco today? WAY cute! Oh, YEAH! You're the cat, Teddy! What's on the menu? If it's ham or prawns, SHARE WITH HUFFLE!!! Yous sure made our Mommy laugh. A before cat loved to has his meal served ath the table with the rest of the family. He sat in his own chair and eatted out of his dish when everybody else eatted. Well Teddy, you are acting polite, but you still have a slightly goon-y expression on your face! Dining al fresco! You look so handsome at the table, Teddy. What would you like to drink? An appetizer to start with? You look like a very prim and proper ManCat! That would probably work in our house, too. Thanks Huffle for being such a good friend to Diamond. You posted news of his birthday, which gave him a lot of pleasure to receive so many visitors. Thanks for your very kind remarks on his blog. I miss him very much. So, how'd that work out for you, Teddy? Did you get served straight away? You has such good table manners, Teddy. Me was wonderin how Huffle is doing. We has been purring. Happy Birthday, Teddy! You are a very handsome mancat. Purrs for Huffle's hip. My woman gave angel, Venus, glucosamine for years 'cause she had hip dysplasia and developed arthritis early. We think it helped her. Purrs.